Machinecollective.org is bringing rapid prototyping to every day artists and hackers. We’ve covered similar interfaces like the monome, MIDIbox, and Stribe. Machinecollective allows you to make your own input system using multiple blocks to get exactly what you want. The setup allows you to fit pretty much anything in a block that you can think of. They’re developing potentiometers, slide potentiometers, button grids, toggle switches, LCD’s, FSR/LDR’s, velocity sensitive pads, and touch screens. Currently, they support software enviroments like: Processing, Max/MSP, VVVV, and Adobe Flash. That list will undoubtedly grow as the community plays with it. 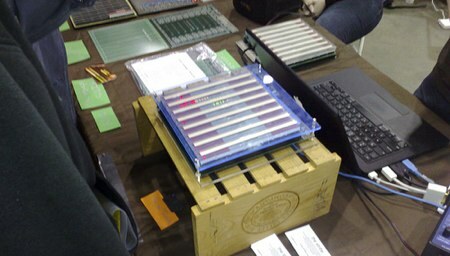 They envision the hardware connecting via MIDI, OSC, RS232, TCP/UDP, DMX, or USB. They encourage others to design their own inputs. Community members can share modifications and designs, though there isn’t a forum or store yet. If you design a setup that you really like, they can even fabricate a single unit for you. Keep your eyes on this one, it could be a real hit. A similar idea for general gadgetry can be seen over at Bug Labs. Starting with a base unit, you can add different input and output modules to create various useful functions. They currently offer GPS, a camera, a display, and motion sensing. Mix and match to make your dream gadget. We saw a lot of interesting gear at Maker Faire last weekend and thought we’d highlight some of those projects this week. [Josh Boughey]’s Stribe was originally inspired by the monome 40h. It features of 16 columns of 64 LEDs for a total of 1024 individually addressable lights. Even with all those LEDs, PWM control means it can run off of USB power. 8 spectrasymbol softpots are used between the columns for user input. It’s really quite an amazing feat for being [josh]’s first board design. All of the circuit designs and firmware are available. Check out Flickr for more photos from this weekend.